The Indie Credential » R.E.M. This was the third time in five years that R.E.M. had played Lancashire County Cricket Ground at Old Trafford and, with the news from Cardiff earlier in the month of the band having to scale down to a venue a tenth of the size of the Millennium Stadium, you could be forgiven for wondering if Manchester would turn up this time, especially as the band’s setlists had become a little tired and predictable on their previous couple of tours. Manchester did turn up in droves, however, even if a large part of the cricket ground was cordoned off making it seem even fuller than it was. Maybe it was the band’s return to form of sorts with the new album Accelerate after the dreary Around The Sun; or maybe the rarity of a warm and dry afternoon in what has been a quite abysmal summer. The support acts were both bands we showed an initial interest in, buying their debut albums before growing bored well before their follow-ups were released. We always had high hopes for the Guillemots as they were such a good live band before they released any albums and before their live shows became weighed down in tedious self-indulgence. Things didn’t start too well with “Get Over It” sounding turgid and empty thanks to Fyfe Dangerfield’s anaemic guitar sound fighting a losing battle with the wind and only bass and pounding drums backing his vocals. They improved from thereon in, first with a couple of tunes we didn’t recognise that sounded pretty good, presumably they were from the latest album, and then with a succession of tunes we did recognise. “Trains To Brazil” and “Made Up Love Song #43” reminded us how good the Guillemots can be while “We’re Here”, given the setting, really should have been played with the full band and not just Fyfe on his own. It was a ponderous version that was quickly drowned out by the chatter of a bored crowd. They finished, as ever, with a 10 minute “Sao Paulo”, which, though it sounded good, left me thinking that they really haven’t moved on as much as they should have in the last couple of years. I’m not sure what I ever saw in Editors. Opener, “Bones”, sounded ok but things got very boring very quickly. They are the post-Interpol Coldplay and while the succession of half-remembered singles from their debut album sauntered by I was playing Countdown with their backdrop. “Steroid” and “storied” for 7, Des. At least Tom Smith seems to have left his ridiculous arms-around-the back-of-the-neck emoting poses behind, instead choosing to clutch his microphone like he’s practicing his new golf grip. We left for beer and food well before the end. We saw R.E.M. 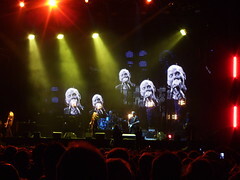 at T In The Park last month and they certainly seem to be hugely re-energised on this tour, as evinced almost immediately with the tremendous opening salvo of “Living Well’s The Best Revenge”, “These Days” and “What’s The Frequency, Kenneth”. The fact that the new songs from Accelerate are invariably short-and-to-the-point rockers is a great help as it means that there is very little slack in the set, unlike last time around when their set was bogged down with the ponderous five minute plus dirges of Around The Sun. With the U.S. elections around the corner it was no surprise to hear some of the band’s more political works with “Drive”, “Man-Sized Wreath” and the ever wonderful “Fall On Me” joining a rare and highly welcome outing for “Ignoreland” in close succession. When Michael Stipe promised something special to mark Manchester’s Gay Pride celebrations, JustHipper immediately predicted “Pretty Persuasion” and she was spot on. It brought a tingle to the spine and it was as if time had stood still for 23 years, which is probably how long ago it was when I last saw them play it, so faithful it was to its original form. We hollered along with inane grins on our faces, as we did a couple of songs later when “7 Chinese Brothers” was dusted off, heads turning inquisitively in our direction as we yelped with delight on hearing Peter Buck’s opening refrain. Things slowed down a little with an unexpected “I’ve Been High” showing that Reveal wasn’t all bad, followed by a quiet, intimate “Let Me In” with the band gathering in a circle and the much of crowd, sadly, resorting to chatter. To be honest, the final third of the gig didn’t reach the heights of the opening hour or so as things got a bit more predictable. “Orange Crush” and “Bad Day” are now firmly entrenched in the R.E.M. setlist and, while both are fine songs, I wouldn’t be sorry to see the back of them for the next tour. 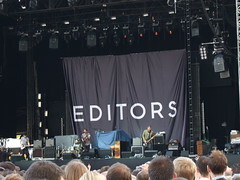 “Imitation Of Life”, however, was a highlight at T In The Park and was just as good here as it closed out the main set. 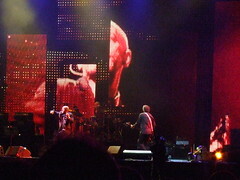 The encores included the inevitable “Losing My Religion” – cue groups of lads jumping up and down with their arms round each other’s shoulders – and “It’s The End Of The Work As We Know It (And I Feel Fine)” and promised another surprise as Stipe introduced a song that “we don’t play very often”. Unfortunately it turned out to be “Mr. Richards”, which may be one of the better songs off Accelerate but it’s no “West Of The Fields”. At least they’ve finally dropped “Everybody Hurts” for this tour, which is especially good as JustHipper promised to buy me a cheap bottle of plonk to celebrate if they didn’t play it, though the ever-present set closer “Man On The Moon” must surely be up for review any year now. 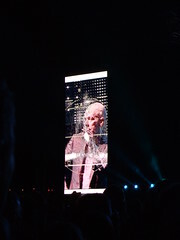 In all, though this performance wasn’t quite up there with T In The Park, it was close enough and I’d go as far as to say that this is probably the best R.E.M. tour since they toured Monster in 1995. Long may they run.